The snow – big, thick flakes – were swirling around outside the massive windows of the voluminous fourth floor ballroom of the Dudley-Davis Center at the University of Vermont in Burlington as our group of 25 food system enthusiasts sat down in a circle of chairs to get to know each other. Knowing it was sub-zero outside, watching the heavy snow falling, and looking forward to a hopefully great week set the stage really well for the inaugural Food Hub Management Certificate Program – the first of its kind in the nation. We 25 participants came from all walks of life and represented all spectrums of the burgeoning local food systems world. Though Michigan and the East Coast were dominantly represented, four of us were from Colorado, New Mexico, and California. As we all have I’m sure, I’ve participated in more than what I would call a necessary number of get-to-know-you circles. Often I approach these circles with an unhealthy impatience – wanting to get through them to the content of the course or program that waits on the other side. Yet I say unhealthy because what does that content matter if not for the people it affects? If not for the people who wrestle with it? Teach with it? Implement it? So instead of being present for the first part of the circle, as people went around and introduced themselves and their various businesses or organizations, I debated with myself this paradox and tried to justify and simultaneously knock back my innate impatience with the exercise. Then a phrase that someone said cut through for some reason. I can’t really say exactly why these three words caught me, but I literally felt a wave of emotion – a chill running through my body and a deep sense of gratitude, almost verging on tears. It was said simply talking about a part of this guy’s daily routine I think, but my internal debate was suddenly flooded out by a wave of reminders about all the ways in which I was blessed in that moment – that I had been selected to participate in this course in the first place; that I was financially and physically healthy enough to be able to travel to Vermont; that Re:Vision helped pay for this opportunity; that, if our endeavors succeed, community members lives will be impacted; that I enjoy countless privileges as a white, middle-class male I often don’t even realize when I’m debating things in my head and not paying attention to the real people right in front of me. And on and on. Thank you. That was it. And all of a sudden I was jerked back into the present – into the moment and starting to look around me and see the people sitting there. “I want our adopted child to know my Papa, and Nana & Grandy.” Ash said in the car as we drove through the wintery flatlands of Nebraska. The statement was profound and we both acknowledged it with a brief silence as we passed through the frozen countryside. We were on our way back from Christmas with her family in South Dakota and it was 10 degrees outside. The wind was creating mesmerizing swirls on the road as it forced the resistant snow flakes from their comfy place in the fields and pushed them into beautiful waves, skimming over the pavement. Ash and I have been married for 5 ½ incredible years. Even as we got engaged back in 2008 we knew neither of us were convinced we wanted to have kids – definitely not anytime soon, and perhaps never. Equally as strong was the non-desire for our own biological children. Even if we someday decided we wanted kids, we reasoned, we wanted to adopt a child who faced the prospect of a long and difficult life without the support of parents who loved them unconditionally. So I got a vasectomy. I was 22. That’s how we make decisions together, especially big ones. We recognize and trust we’re on the same page about something, and, if it makes sense, we act. No need to second-guess or get lost in endless ‘what-ifs’ that could dead-end in indecision or missed opportunities. This is how we turned in our application for Peace Corps three weeks after we got married. Or how decided to buy a house. It just made sense. But kids, we thought, were different. For the first five years of our marriage, we were extremely unsure we’d ever want to be parents. We felt we weren’t mature enough, weren’t ready, were too selfish, etc. Yet, in the last few months, slowly, we’ve started to drop comments to each other that perhaps adopting wouldn’t mean the end of our lives. That perhaps kids, five years off of course, could be a part of our lives. So this slow acceptance of realizing that we perhaps did indeed want to adopt someday, combined with Ash’s statement yesterday in Nebraska, set off our minds and hearts. And so it begins. True to our style, in the last 24 hours we’ve decided that we indeed would start looking into adoption, signed up for two informational sessions at two different adoption agencies, created a Google Spreadsheet to gather research in, and have narrowed our search to either a domestic Foster-to-Adopt program, or an international adoption from a Latin American country. We’ve known for a long time that we’d want to find a child who is probably older than 2 years old, and that we didn’t have a strong gender or race preference. So the journey has started. I’ll do my best to chronicle our progress, our thoughts, our desires, our fears, our successes and challenges. We want to journey through this with our family, with our friends. So please join us. For years now people have mistook Re:Vision’s Kepner Middle School Educational Farm for a dumping ground and left trash there – anything from lawn mowers that don’t work to tires, old sections of plastic fence, and empty oil drums. As countless volunteers have helped Re:Vision grow the garden’s size and scope over the years, cleaning up this trash pile always seems to fall to the bottom of the to-do list. The small patch of space with tall grasses and a few trees offers a convenient and out-of-the-way place to pile the trash for ‘later’. Well, today was later. Yesterday a team of volunteers loaded the trash high in a large dump trailer and this morning I hooked it up to the truck, checked the straps to ensure nothing wouldn’t make it all the way out to the landfill, and began the trip across town. Have you ever been to a landfill? I know its been about three years for me. I worked landscaping through college and there were a few trips back then to carry various types of debris out to ‘somewhere else’. Every time I see a landfill, whether here in Denver, or abroad in Nicaragua or Niger (very different experiences mind you), I am struck with both gratefulness and guilt. Wonder and disgust. Mindfulness and a desire not to know. Gratefulness that I don’t have to see the vast wreckage called a landfill every day. Guilt that my trash’s ‘away’ is here – buried beneath this dirt and littered across hundreds of acres. Wonder at the shear mass of garbage and the massive machines running around the clock to pile dirt on top of it. Disgust with myself and my brothers and sisters who are so wasteful so as to consume and throw away so much. Mindfulness that forces recognition and acknowledgment of my imperfection and the imperfection of society. The desire not to know, not to be reminded of this horrible truth the machines are working so hard to cover up – the impact we humans have on the planet is immense and undeniable. And those dots in the sky? Seagulls, thousands and thousands of seagulls. When I was still about ½ a mile away from the dump site I could see a column of them swarming and circling hundreds of feet high. The sight made my stomach sink. It made me think of death, of vultures, of tragic imbalance. What other creature produces so much waste that cannot be reused by another creature? What other species rips minerals from the earth and converts them (ingeniously) into products that are only designed to be useful for a few years (at best) but whose materials are toxic pollutants that take centuries to break down? Was this what God meant when he said to Adam and Eve to rule over the Earth and subdue it? Nothing could feel further from the truth as I stood there, almost weeping at the enormity and gravity of the landfill. 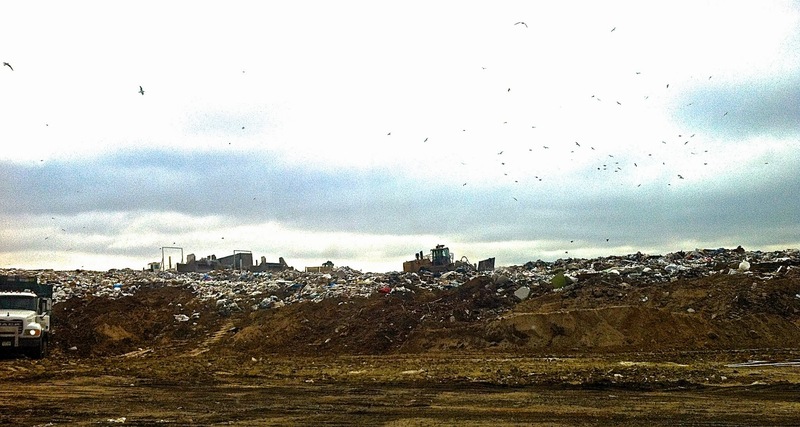 What would happen if every man, woman and child had to spend a few hours at the landfill each year? Would our culture begin to realize that when the trash truck comes for our dumpsters or bins, ‘away’ is actually a very real place? Would it change our behavior? Would we opt for recycling more, for composting more? For consuming less, for reusing more? Perhaps this is a glimpse into my soul. Maybe I’ve felt this for a long time and that is part of why I find myself so hesitant to talk sometimes. Its on my mind constantly how words cannot capture experience. I feel words cannot do justice to reality, to faith, to pain, to love, to God. I sense somehow when I try to speak or write words (yes, irony wins out as I type this..) that I must try to simplify that which can not be simplified without losing a vital piece of itself. My spirit, more accurately, my breath of life God continues to give me, mutters unclearly about everything. And perhaps my goal shouldn’t be to understand or discern clearly what it means. But instead to simply hear it. To live and be present as it speaks. Indeed even pondering something stands in this paradox unlike ‘wondering’. To ponder means I try to put words or thoughts in order and understand or comprehend whatever it is I’m experiencing. Yet the words I choose and the conclusions they lead me to are invariably tainted with my paradigm, my previous experiences, my previous conclusions. So because words are the foundation for so much of our communication, our mutual interactions, perhaps the challenge is not to negate them, or hold disdain for them, but instead to embrace them in full light of their inadequacies. Words will never be 100% true. Only basic, un-filtered experience is true. Though I appreciate that as broken relational beings, as humans who, in spite of being impregnated with “inherent dignity and importance” as Richard Rohr puts it, by our Creator, have chosen another direction than what God intended for us, we must use our words. We must try to capture the truth and communicate it with these imperfect tools. Conceivably this is why we in Western culture and traditions get so frustrated, angry, rageful even, when we hear others claiming to be describing the perfect, the right, the truth, using such inadequate things as words. Just think about our political leaders, about the religious elite, about the corporate CEOs. They can hardly ever agree. And instead of accepting that this might be more due to the defectiveness of language and therefore trying to seek greater understanding, they instead fall into the same pit and pitch their own tent in the sand, claiming that it will stand the ferocious winds while those of their opponents wash away. What would happen if we all stepped out of our tents and stood in wonder together at the sunrise over the ocean? What if we all realized our tents of posture, ego, and pride are all fleeting and fragile and staked into the shifting sands of our experiences? Would we then turn and help clear the beach of these wigwams of futility? Would we work together to dig down to the bedrock of commonality and build a structure of solid love that would stand firm in the shifting sands of time, the winds of extremism, and the crashing waves of hatred? It is something which permeates every facet of our lives – it is the foundation of hydration, our food, our heating and cooling systems, our construction, our clothing and shelter. And we’re using A LOT of it. According to Denver Water, the City & County of Denver uses 265,000 acre-feet of water. Imagine a football field with a foot of water standing on it – then picture 265,000 of those. Let’s put it another way. The average person in Denver uses 168 gallons of water per day! And lest you think its all those restaurants and businesses squandering all that water, in all reality, residential (single and multi-family homes) usage accounts for over 65% of all usage (172,000 football fields full of water!). A quick scenario to bring this home. My wife and I recently purchased our first home in the Barnum neighborhood in August. The average sprinkler head sprays about 3.5 gallons per minute, and the home had a sprinkler system consisting of about 10 heads. Now, if we watered as per Denver Water’s Stage 2 watering rules (in effect as of April 1st this year), which is only twice per week, we’d use about 27,000 gallons from May through September and spend about $75 in water bills. And this is a reality for 200 low-income families this year through Revision’s Re:farm Denver program. 200 families are receiving drip-irrigation systems, using less water, saving money, and are empowered to lead healthier lives. Want to help them out? Donate now. Suddenly I could feel, even while speaking words I had spoken a half dozen times before, that familiar tightness in my throat. My eyes began to burn as I tried to keep my cool and finish my sentence but the welling up in my throat wouldn’t allow it and somehow the muscles attaching my chin and lower lip were colluding with my vocal chords as both started to tremble. Yep. I was crying. And the feeling is familiar because I actually cry quite often. I don’t know what it is, but I find myself touched in profound ways by other people’s stories, even if they are fictional. Extremely Loud and Incredibly Close (the book and movie) had me in tears multiple times, as did Up, The Intouchables, the wedding I was at this weekend (well, if I’m being honest, pretty much every wedding I go to), and countless other times throughout my young adult life. This particular moment I was sitting across from my dad at my favorite breakfast place in Buena Vista; the Evergreen Café. I had ordered the eggs St. Elmo, named after a deserted 19th century mining town nestled in the Chalk Creek canyon between Mt. Princeton and Mt. Antero just Southwest of BV, the dish was home potato fries covered in melted cheese, two eggs any style (sunnyside up for me), and wheat toast. The coffee aroma wafting from my cup came from beans carefully roasted just down on main street at BV Roastery. Yet all this took a backseat as I tried to figure out my own overpowering reaction to the words I had just said. I was talking about the work of Revision International, which I often do. I was telling my dad about an exciting new partnership we’re entering into with the Denver Foundation and members of the Somali Bantu refugee population living in Denver. We’re helping forty Somali Bantu families start farming a one-acre vacant lot in Southwest Denver. Not only is this going to provide fresh, healthy food for their families and the surrounding community, it is also reconnecting the Somalis to their culture – their heritage. The Bantu people in Somalia were an especially persecuted group of people, having been brought as slaves to that country from mainly Southeast Africa in the 18th century, but having chosen to try to retain their unique language and culture instead of assimilating. After spending years and years in refugee camps in Kenya, some were offered asylum in the US. Since coming to Denver, these families (trickling in over the past ten or so years, now there are about 400 refugee families in the Denver-metro area) have been struggling to get their feet under them, and find their own way in this foreign society. On a walking tour of the vacant plot about a month ago with Revision’s ED, Eric Kornacki, one elder started to cry as he stood looking at the land. Eric asked him, through another Bantu named Rasulo who speaks excellent English, why he was crying. The words came back from Rasulo’s lips saying the man had the same feeling at that moment – gazing upon land which he might be able to start farming – that he had first had the moment he heard he would be able to bring his family to the United States from the refugee camp. I’ve been processing this ever since Eric told me of the exchange the next day. It takes immense imagination to try and place myself in a refugee camp in Kenya, forced into exile from the land which had persecuted him. Then held there, in that camp, for a decade before hearing that there was hope for a different future. I try to ask myself; would he have lost hope at that point? What did he do in his time in the camps? Were his children born in the camps? Had he any reason to think they might have a better future than that he had had? Then to hear that there was an end in sight. How immense the excitement must have been. How tangible the hope and how incredible the joy on his face and in his heart when he told his family the news. Nor can I comprehend how important farming and growing food must be to him and the Somali Bantu culture to have those same feelings standing on an overgrown acre of land surrounded by the cityscape as when his life changed and he moved continents. We take so much for granted as a culture here in the US, as “Americans”. We don’t give a second thought to food. Perhaps we enjoy cooking, or maybe gardening, but it can’t be said it’s a part of who we are as a people. In fact I struggle to think of anything aside from technology that defines the American culture. Do we have something, anything connected to nature or the Earth that sustains us which we feel anything close to these emotions when we think about it? How amazing to be a part of this opportunity for these families, this beautiful sub-culture of human beings. I feel honored to have met them. To have the possibility of getting to know them deeper and hear more of their stories. Perhaps I was crying this particular time of recounting the story because I had lost sight of why I was working so hard. Maybe I couldn’t see the beauty of the forest because I was stuck wading through the thicket of trees. But I feel for some reason in that moment I had stumbled onto a hilltop or broke out of the dense trees and had to squint my eyes and reset my paradigm as I took in the awe-inspiring landscape surrounding me. The forest and its immensity couldn’t be more breath taking. And yet I feel the awe precisely because I know the forest wouldn’t exist without each tree. Each tree is every act of kindness. Every action toward justice. Every person who decides to honor someone else before fulfilling their own instant desires. Gratitude overwhelms me realizing that I am simply one tree in this forest of humanity. My roots draw life from the same soil as the Somali Bantu; my leaves stretch toward the same sunlight which bathes the Hispanic/Latino families of Southwest Denver; the rain which stimulates my growth also falls on the refugees still in camps in Kenya and drenches those who are struggling with fear of deportation from the States or living with loved ones who are stuck in the middle of drug wars back home or those who are dying from famine in the Republic of Niger or living repressed by Israeli settlements or fighting for justice in the streets of Cairo or working grueling hours in sweatshops with no chance for a brighter future let-alone a vacation. We are all human. The forest wouldn’t exist without each one of us, and yet alone, we’d wither and die under the scorching heat of the sun.